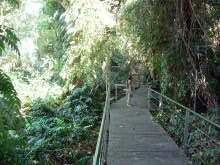 This Darwin City Rainforest in Doctors Gully is an unexpected bonus to anyone visiting the fish feeding or walking down from the Esplanade. 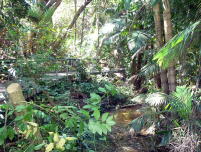 The area has a colourful history, site of the first freshwater well in the new settlement established by George Goyder in 1869, but today is a quiet boardwalk through dense rain forest. The easy way there if you are on foot is to walk down behind the bus stop outside the YWCA in Mitchel St.
A short walk takes you from a busy street to a long stairway leading to a dense forest area. 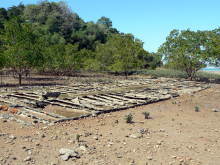 Follow the wooden walkway through the jungle to emerge at the location of the fish feeding tourist centre. 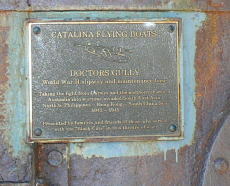 A rusty harbour buoy stands guard, carrying a memorial plaque for the WW11 Catalina Squadron. 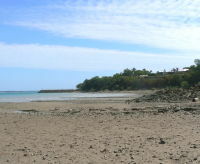 If you arrive at low tide the place will be quiet, fish need water to put on a show . Check the tide times if you want to see the hundreds of fish and rays that come in for a free feed at high tide. WW11 relics exposed at low tide. Boardwalk through the rain forest.